Current Aeronautical Fatigue Problems contains the papers presented at the Symposium on Current Aeronautical Fatigue Problems, held in Rome in April 1963. The symposium is held with the purpose of reaching a fruitful and effective exchange of information on all aspects of fatigue problems in aeronautics. The main subjects covered in the symposium were: elevated-temperature effects, crack propagation and residual static strength, and structural fatigue testing. 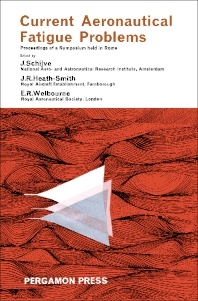 The specific topics discussed include the importance of non-linear interactions which affect creep and strength properties under variable stress and temperature; the factors affecting the fatigue life of a light alloy supersonic transport aircraft; the techniques of fractography applicable to crack propagation problems; and the use of ordered, cyclic, test loadings to represent the complex loading histories generated in service. Aeronautical engineers, materials scientists, physicists, and metallurgists will find the book invaluable.